If you have a full leg of lamb, trim of fat and cut into 1 inch steaks against the grain. I buy boneless leg of lamb, and find that I usually end up with about 10 steaks of varying sizes, based on the shape of the meat. Chop the garlic and rosemary together to form a loose paste. Rub the steaks on both sides with the paste and place in a Pyrex or other shallow bowl. Pour the wine and olive oil over evenly, cover, and marinate for 2 hours or longer. You can refrigerate or leave out. Light the grill and pre-heat to medium high. Sprinkle the steaks with salt and pepper and grill. Watch carefully as they may flame. If you cook entirely uncovered, about 6 minutes a side for medium rare. If you cover to reduce flames, about 4 minutes a side. Let the meat rest for about 5 minutes (steaks will continue to cook while resting). Serve whole or sliced over Farro, another grain, or potatoes. 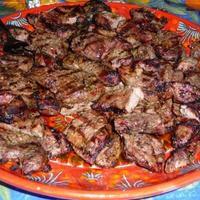 I have grilled Lamb before, but, never so good! This recipe was a 10 in my book! I altered it a bit though... I sauteed a mixture of onions, green peppers, roasted peppers and sliced mushrooms in olive oil. I then added a bit of the green marinade that was left over from seasoning the meat and some hot sauce (not too much). This went on top of the meat when I served it with potatoes and corn. Very yummy! Tender and very flavorful! Try this recipe! This is an marvelous blend of herbs; just might replace the age-old leg of lamb this Easter! Have a bottle of Malbec - think I'll try it soon. This looks awesome! I want to try this with my friends. Substitute a sprinkling of soy sauce instead of or in addition to the salt to add a bit of depth to the final result.